Many people who have visited friends or family in Germany have had the chance to sample food you do not find in restaurants. 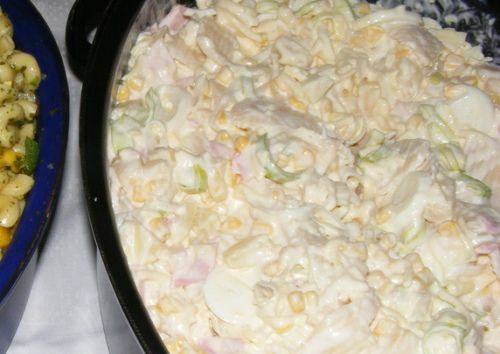 German Noodle Salad is a typical party food which everyone knows how to make, but which never made it whole-heartedly to America. But a combination of noodles, German bologna, and mild cheese cubes dressed in mayonnaise is a classic. Cook the noodles in broth or water al dente, according to directions on the package. Drain and cool to lukewarm. Place the noodles, bologna, cheese and peas in a large bowl. Mix all the ingredients for the dressing. If you have access to German Remoulade Sauce, use that instead of the mayonnaise, parsley, pickle relish, onion and cider vinegar. Pour the dressing over the noodle mixture and stir until everything is well-coated. Gently stir in the chopped eggs last. If salad is too dry after chilling (the noodles soak up the sauce), add a little extra mayonnaise mixed with a little vinegar.